Honduran migrants walking toward the U.S. depart Chiquimula, Guatemala, last Wednesday. The group of some 2,000 Honduran migrants hopes to reach the United States despite President Trump’s threat to cut off aid to Central American countries that don’t stop them. They always say that everything is bigger down in Texas. Apparently that goes for the lies. When President Trump — the Yankee who puts the hat in the phrase "all hat and no cattle" — flew to the Lone Star State on Monday night to campaign for "Lyin' Beautiful Ted" Cruz for re-election to the U.S. Senate, he fed his crowd at Houston's Toyota Center whopper after whopper. And they gobbled it up. Some of the 45th president's blatant falsehoods were tired — like the 50,000 people Trump claimed were outside the arena unable to get in (maybe 2,000 to 3,000, tops, according to police) — but much of it was hot-wired to raise the blood pressure of his right-wing base both on the arena floor and watching on TV. Untold thousands of unauthorized immigrants ("We've got so many people voting illegally in this country, it's a disgrace") are casting ballots for Democrats — something that even the most ardent conservative has never proved because it isn't happening. 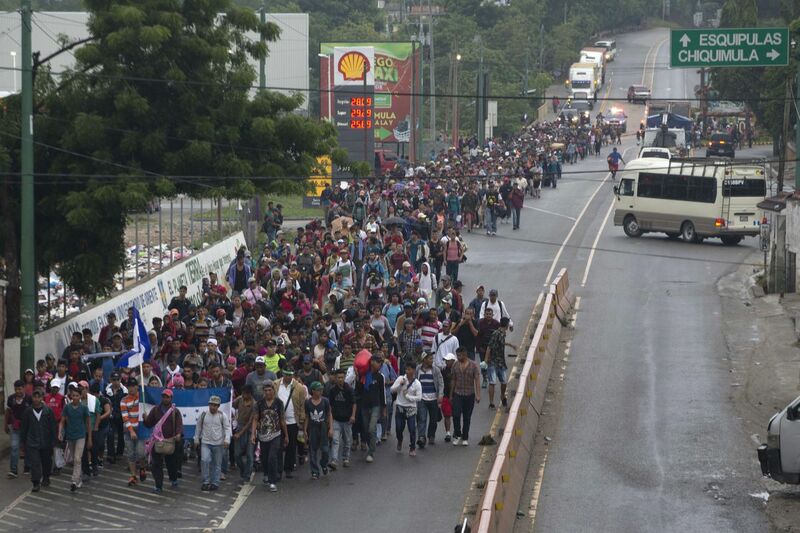 A caravan of several thousand Honduran migrants headed north through Mexico toward the United States isn't the result of rampant crime and poverty, Trump insisted, but of "Democrat laws and activist Democrat judges." The president did leave at home some of biggest lies of the last lie-filled week, like the one where Democrats are promising migrants brand-new luxury cars or, even more bizarrely, that folks are rioting in California "to get out of their sanctuary cities." (Huh?) And yet there was one terrifying moment Monday night when Trump made it clear there is no bottom — that he will go to any depth to stir up hatred and anxiety in order to keep just enough Republicans left Capitol Hill to save him from impeachment, or at least to launch an uncivil war to keep his enemies at bay. "A globalist is a person who wants the globe to do well — frankly, not caring about our country so much," Trump told the Texans, reaching for a word that's long been a favorite of those who believe there's an international conspiracy led by Jews. "And you know what, we can't have that. … You know what I am? I'm a nationalist. Use that word." Thousands of dangerous extreme right-wingers, from Nuremberg to Charlottesville, have flown the banner of "nationalism" — but never before with a presidential seal of approval. And the crowd went wild, chanting, "USA! USA!" To steal a phrase from the 76ers' over-caffeinated marketing department, welcome to the moment. Those of us who've been warning for more than three years that Trump is the avatar of a uniquely American brand of neo-fascism have also argued that any descent into tyranny would come much like the famous analogy of the frog in boiling water, that you'll barely notice the rising heat from day to day until it's unbearable — and too late. Is it me, or is getting really hot in here? Over the last couple of weeks — ever since the fight to confirm Supreme Court Justice Brett Kavanaugh proved that a credible allegation of teen sexual assault wasn't so much a bad thing as a trigger to stir up white male voter rage — the White House has thrown open its Pandora's box of lies as well as insane proposals that might tear America apart at the seams but will also drive up Republican turnout on November 6 by a point or two, which is the only thing that matters to Team Trump. I'm old enough to remember when a super-controversial policy move was the kind of thing an administration would keep under wraps until after an election. Not so in 2018, when a leak to the New York Times (a call that almost surely was coming from inside the house … the White House) revealed a Trump administration memo to redefine gender throughout the federal government to eliminate the very concept of "transgender" — an erasure of as many as 1.4 million Americans that carries echoes of the erasure of … well, do I really need to spell it out? The National Center for Transgender Equality, NCTE, and the Human Rights Campaign gather on Pennsylvania Avenue in front of the White House on Monday for a #WontBeErased rally. What happened next is exactly what all the president's minions wanted: Outrage. Protests by transgender Americans and their allies flooded the streets of Manhattan within hours of the Times report and moved to the gates of the White House on Monday — generating hours of TV video of furious LGBTQ activists that will be surely be shown in a repeated loop on the Fox News Channel, thus raising the blood pressure of 71-year white grandpas who'll now be certain to leave their couch at 6 a.m. on November 6 to prevent an alliance of men in drag and Honduran refugees from assuming full power. To hold his right-wing base together and drive them to the polls, Trump's weaponry includes such diverse elements as … fear. Actually, that's pretty much the only element he's got — fear — and so he is turning up the volume to deafening levels. This is hardly a new political tactic — remember the "ebola scare" of 2014 that vanished from the headlines as soon as a GOP midterm landslide was in the books? — but the president is taking this to new depths, with his unfounded accusation that "unknown Middle Easterners" have infiltrated the migrant caravan or that Democrats are behind the whole thing. A former Trump adviser named Barry Bennett told the Washington Post that the Central American caravan is in fact "a political gift" to the Republican Party, adding: "I wish they were carrying heroin. I wish we'd thought of it. It speaks to our dearth of creativity, unfortunately." But what Team Trump has accomplished — by lumping the women who flooded the Senate corridors and elevators in a desperate bid to stop Kavanaugh to other protests against the president's intentionally divisive moves and calling it all "a Democratic mob" — has been creative enough, apparently. - "Trump is waging a fact-free campaign of fear ahead of the midterm elections"
Trump and his amplifiers on Fox News have scared the living bejesus out of Republican voters, especially the older ones most inclined to vote in midterm elections. Carol Shields, 75, told the New York Times that she was terrified that immigrant gangs wouldn't stop at the border but keep going all the way to her northern Minnesota, where they might break into lake homes. "What's to stop them?" Shields, a retired accountant. told the Times. "We have a lot of people who live on lakes in the summer and winter someplace else. When they come back in the spring, their house would be occupied." Where does the president even get this strategy? Maybe from his good friends, the Russians. Last week, the Justice Department indicted a Russian aide to one of that country's billionaire Putin-crony oligarchs for using social media to, again, meddle in an American election — this time, the looming 2018 midterms. The indictment accused Elena Alekseevna Khusyaynova of running a shadowy network to "create and amplify divisive social and political content" on Facebook and elsewhere, with posts about racism and mass shootings. If you've followed this wing of the so-called Trump-Russia scandal closely, you know that the St. Petersburg-based trolls almost never overtly persuade Americans to vote for Donald Trump, their preferred candidate. Their posts about topics like Black Lives Matter are meant to do two things: To make conservatives really mad and anxious so they'll vote, or to make core Democrats like African-Americans or college students so discouraged they'll stay home. But in 2018, the Russians don't really need to be so active. Trump is doing their divisive dirty work for them, from the presidential podium. It didn't used to be this way. American campaigns could be vicious (ask Thomas Jefferson) or dishonest (although not the easy-disprovable Big Lie we see today) but the president's job was always to stay above the fray, to be a uniter, not a divider and offer high-minded talk about the American Dream. Yet thought leaders, going back to the Founding Fathers, warned that some day a demagogue might plow through the guardrails of democracy, and win votes by appealing to fear itself. Donald Trump was their nightmare. But we, the electorate, have surely helped Trump with what's most often called (with a lack of political correctness) our tribalism. As the author of a new book called Uncivil Agreement: How Politics Became Our Identity, University of Maryland political scientist Lilliana Mason, spells out, "our conflicts are largely over who we think we are rather than over reasoned differences of opinion." In other words, the sorting of the parties that took place after the civil rights battles of the 1960s — as the GOP became uniformly conservative and Democrats became solidly liberal — meant that party ID, and deep distrust of the other party, became core to our overall identity. That deep psychology is what Trump is tapping into when he blames Democrats for the caravan, however irrationally. And it seems to be working. Before Kavanaugh and the president's war on truth and national unity, the pollsters and the pundits agreed that Democratic voters were pumped up for November and Republicans were deflated. Today, Democrats may still be fuming mad over the Supreme Court fight, but their enthusiasm had already nearly maxed out. GOP voters, however, are catching up. Democrats have a small edge over Republicans in voter enthusiasm among likely voters, according to a new NBC/WSJ poll. A new NBC News/Wall Street Journal poll finds that 72 percent of Democrats have a high enthusiasm for the midterms, an all-time record. In a normal year, that would spell a Democratic landslide — but this is not a normal year. In the aftermath of Trump's fear-mongering offensive, 68 percent of GOP voters are also highly enthusiastic, a record for their party. The result is the epic long lines for early voting that you've been seeing in Texas, North Carolina and elsewhere. Trump's presidency has achieved what was long thought impossible: He has made Americans fiercely passionate about a midterm election. And all it took, we now know, is an open, public embrace of "nationalism." But this is nothing to kid about. No matter what happens on November 6, the temptation for Trump to keep turning up the gas underneath America's frog pot is going to be too great. The Kavanaugh caper, combined with any uptick for the GOP on Election Day, may convince the president he can get away with shutting down Robert Mueller's probe of election skulduggery and alleged cover-ups. Or, amping up phony crises on the southern border or with North Korea or elsewhere may lose its luster and cause Trump to launch a real one. Having crushed the notion of objective truth and unleashed the full fury of white nationalism, POTUS 45 may want to see what happens when he turns the heat all the way to "high." And when he does, we'll be thoroughly cooked.